Individual development and innovative learning are vital ingredients for graduate success at INTI College Sabah, where competitions such as ICS Hospitality Fiesta are organized to hone students’ practical abilities and equip them with the right attitude and skills to take on greater challenges and responsibilities. Robinson, Joshua and Adeline (front row, 4th, 5th& 6th from left respectively) pose with the judges, fellow contestants and INTI’s faculty. As cluster leader of Malaysia Centre of Tourism and Hospitality Education (MyCenTHE) in Sabah, INTI College Sabah organizedICS Hospitality Fiesta 2013 as one of its many initiatives to enhance tourism and hospitality education to meet world class standards. The competition, held at the College’s Paradise Café and mock kitchen, was divided into three categories:black box cooking, bar tendering and table setting. 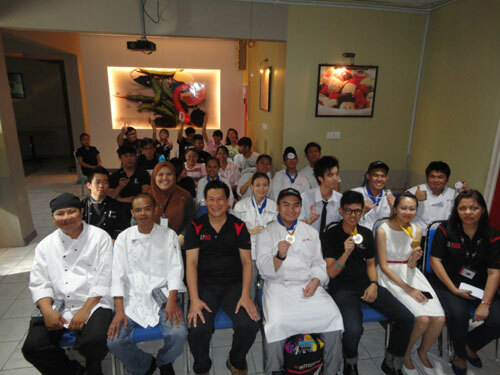 Close to 30 students took part in the competition which had Duncan Hong, Sales Managerof Bunga Raya Island Resort and Spa;Senior Chef De Partie Adrian Onic, Chef De PartieFrindyJaukitand Stephen Gambut (Banquet Manager)of Nexus Resort and Spa Karambunai; and Richard Spiji, Education Counselor of INTI College Sabah as judges. The winners for black box cooking, bar tendering and table setting were Robinson Malangking, Joshua Cho and Adeline Lo respectively. “Hospitality Fiesta is a great avenue for School of Hospitality students to showcase their practical skills in F&B. They learn to be accountable for how they perform in front of an audience and judges from the hospitality industry and in the process, acquirea supreme level of self-confidence. Ultimately, theygain valuable learning experience thatwillinspire them to greater achievements in college and beyond,” said Maria Luisa, Head of School of Hospitality at INTI College Sabah. INTI College Sabah’s special role as the cluster leader of MyCenTHE in Sabah, and its close ties with leading industry players, in particular first-class resorts like Shangri-La TanjungAru& Spa,places it in an ideal position to spearhead human capital development in the hospitality and tourism industry through education. Since 2012, RM 1 million has been invested in new and upgraded facilitieson campus, including for tourism and hospitality training. These include a new reception, servicing and counseling area, mock housekeeping room, upgraded training restaurant and refurbished hostel for student accommodation. INTI College Sabah currently offers the Certificate in Hotel Operations and Diploma in Hotel Management – Work-based Learning programmes, which help students develop the skills that are necessary for the exciting world of hospitality. Both theoretical and practical aspects of learning are emphasized in these programmes.